Skiers wearing knee supports are a common sight on the slopes, unfortunately it is mostly post injury and usually following reconstructive knee surgery after a skiing injury. As Solihull sports injury practitioners we see many snowsports injuries. 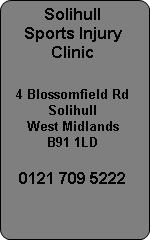 Our clinic is located in Blossomfield Rd, near Solihull town centre Solihull. Knee injuries are most common with injury sustained to collateral knee ligaments, cruciate ligaments and menisci tears, which is a torn cartilage. Novice skiers are more prone to injury but experienced skiers can take a tumble or be wiped out by a novice on the slopes. Skiing is the only sport we see which has a very high risk of knee injuries and yet nobody seems to consider injury prevention. Football, cricket, rugby, cycling, skateboarding, martial arts and most sports where there is a minimal risk of injury wear some kind of mechanical protection but skiers generally wait until they get a serious knee injury before putting on a knee support. This seems utter madness to us as the purchase of 2 knee braces to protect the knees will provide support and help protect ligaments should you be unfortunate enough to fall or slip on the snow. There seems an irony to see skiers wearing the knee braces after the injury because of a weakness or worse still they are prevented from ever skiing again due to a more serious knee injury. Prevention is much better than cure and a knee brace worn under your trousers would not be noticed. It may save you from being months off work and being unable to take up your normal exercise regime. Think safety and wear knee braces ! One day you may be the victim of a snowsports accident and sustain a serious knee injury and regret that you ignored this advice. Knee Injury in Skiers are the most common injuries on the slopes. Snowsports such as skiing and snowboarding have a high risk of injuries from slipping and falling hard on the snow and ice. Protection is advised by our Solihull Sports Injury Clinic staff who are based in our Solihull and Tamworth Sports Physiotherapy Clinics.